Jane Schmidt is a Certified Parent Coach in private practice in Seattle, Washington, and the founder of Parent Coaching Northwest, LLC. 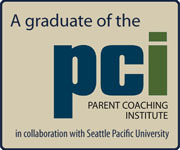 Jane received her Bachelor’s degree in Psychology from the University of Washington and completed her graduate-level training at the Parent Coaching Institute through Seattle Pacific University. In her practice, Jane helps parents understand what their children need in order to develop healthy minds, emotions, social skills and bodies. Jane recognizes that the cumulative, daily decisions parents make matter immeasurably to the development of their children and believes in being an advocate for children by being an advocate for their parents in facing the many day-to-day challenges of parenting in today’s world. A principal focus and passion of Jane’s practice is helping parents manage and navigate our media-and-technology-driven culture. Jane helps parents balance their children’s undeniable fascination with media and technology with the parents’ understandable concerns about media and technology. Helping parents have the relationships and lives they want to have with their children, that’s what Jane does. Jane lives in Seattle with her husband and 15-year-old twin daughters.